The Whiplash Protection System (WHIPS) consists of specially designed hinges and brackets on the front seat backrests designed to help absorb some of the energy generated in a collision from the rear (when the vehicle is "rearended"). In the event of a collision of this type, the hinges and brackets of the front seat backrests are designed to change position slightly to allow the backrest/head restraint to help support the occupant's head before moving slightly rearward. This movement helps absorb some of the forces that could result in whiplash. • The WHIPS system is designed to supplement the other safety systems in your vehicle. For this system to function properly, the three-point seat belt must be worn. Please be aware that no system can prevent all possible injuries that may occur in an accident. • The WHIPS system is designed to function in certain collisions from the rear, depending on the crash severity, angle and speed. Occupants in the front seats must never sit out of position. The occupant's back must be as upright as comfort allows and be against the seat back with the seat belt properly fastened. 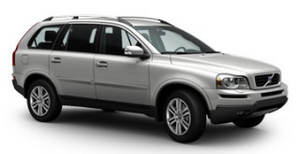 • If your vehicle has been involved in a rear-end collision, the front seat backrests must be inspected by a trained and qualified Volvo service technician, even if the seats appear to be undamaged. Certain components in the WHIPS system may need to be replaced. • Do not attempt to service any component in the WHIPS system yourself. Any contact between the front seat backrests and the folded rear seat could impede the function of the WHIPS system. If the rear seat is folded down, the occupied front seats must be adjusted forward so that they do not touch the folded rear seat. • Boxes, suitcases, etc. wedged behind the front seats could impede the function of the WHIPS system. • If the rear seat backrests are folded down, cargo must be secured to prevent it from sliding forward against the front seat backrests in the event of a collision from the rear. This could interfere with the action of the WHIPS system.